The victims of Stalin’s Terror and the Gulag are respectfully remembered in Norilsk, but the city now has a more promising future. The Arctic city of Norilsk generally doesn’t get a good press from the Russian media. Journalists home in on its extreme climate, the state of the local environment and drag up the grimmest pages of the city’s history – the Stalin-era Gulags that were once on the outskirts of the city. Located about 3,000 miles from Moscow, the easiest way to travel to Norilsk is by plane. I flew there with local airline Nord Star in about four hours. On arriving, the captain announced without a hint of irony: “Our plane has landed at Alykel airport. The weather outside is pretty average, -28C.” For Norilsk in November, it really is pretty average weather. Development of the Taimyr peninsular began in the 17th century but it didn’t have any residents until much later. The first house in Norilsk was built in 1921 by members of a geological survey team. It was a simple wooden shack, with four rooms, crudely put together tables and chairs, a stove and kerosene lamps – the same as you might find in any village in Russia. The only difference is the snow and relentless ice outside the windows for the duration of the dreary Norilsk winter. The first house still stands in the middle of the city, as a reminder of the hardy souls who first settled here. Urbanized romance. Source: Press Photo. The town does not try to cover up the fact that there was a Gulag camp here in the Thirties. Indeed, it shows a refreshing willingness to face up to its past. The local museum has a new exhibition dedicated to the camp’s victims and survivors and there is a memorial 'Norilsk's Golgotha' to the scores of local victims of Stalin’s Terror at the city’s first cemetery on Schmidt Hill. Norilsk’s industrial regions are an environmental hazard. The lion’s share of criticism is directed at the giant Norilsk Nickel mining company whose operations surround the city. However, environmental experts believe that the situation in the region is far from being an emergency. The head of the company’s Polar Division, Yevgeny Muravyov, makes no attempt to conceal the difficulties the firm’s management faces. “You can’t even imagine the attitude to ecology in the Soviet period. Now we have to rake over that legacy,” he shrugs, as he begins to list the many initiatives to tackle pollution being carried out in the city. The most ambitious of these programmes aims to cut sulphur emissions radically. Mr Muravyov explains that in other Russian or foreign plants, sulphur dioxide is recycled as sulphuric acid, which can then be sold. It’s woefully unprofitable, but essential for the environment. The problem with this approach in Norilsk is that transopity sulphuric acid from the city is simply impossible because of the city’s isolated geographical position. 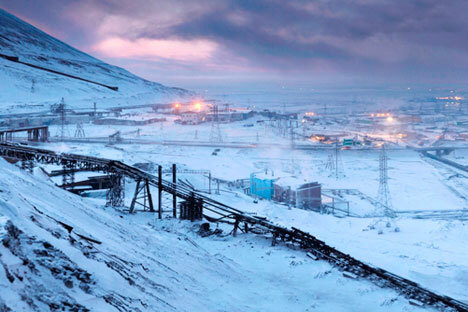 Norilsk is cut off from the main part of Russia for long periods of the year. Cold comfort: in January, temperatures can fall to -40C. Source: Press Photo. Instead, the company has now invested in new technology designed to eliminate elemental sulphur from the flue emissions of the metallurgical plant, which will be installed at both of the company’s Norilsk facilities by 2019. The cost of installation runs into billions of dollars, but the new technology will reduce sulphur emissions in the flue gases by at least 95pc, which will cut sulphur dioxide emissions by four-and-a-half times. I take a cautious sip of the tap water – and to my surprise, there’s not a hint of the chlorine I’ve become used to during my life in Moscow. And the air here, even for asthmatics like me, seems OK, although, at -28C, I was lucky with the weather. Medical experts believe that a mixture of long winters, a shortage of sunlight and environmental problems is very likely to cause depression. Yet the inhabitants of Norilsk don’t seem to smile any less than people in any other Russian cities. “So what’s the secret?” I ask Natalya Fedyanina, from the Northern City media company, an organisation which, aside from its main activities, provides Norilsk with a host of cultural activities, including exhibitions, festive events and even flash mobs. “Everyone agrees that winter is great; it is a time when we go hunting and fishing. We go argishing every week,” she replies enthusiastically. “Argishing”, apparently, means going on a trip into the countryside for a pursuit such as fishing. The annual festival for Taimyr indigenous people marking the onset of the polar night is called “The Big Argish”.